You'll be £10.00 closer to your next £10.00 credit when you purchase Great War Lives. What's this? The Great War was a key event of the twentieth century and it is one of the most popular and rewarding areas for historical research - and for family historians. More records than ever are available to researchers whose relatives served during the war, and Paul Reed's new book is the perfect guide to how to locate and understand these sources - and get the most out of them. In fascinating detail he follows the stories of twelve service men who fought and died in the Great War – a rifleman, an infantry officer, a tunneller, a gunner, a Royal Marine, a naval rating, an airman, and others. He describes their wartime careers and shows how they fitted into the armed forces. He looks at what they did, at their lives in the front line, in the rear areas, on leave, and at the conditions they endured and the experiences they had. And he demonstrates how the research was done and how the lives of these individuals were reconstructed - the methods that were used, the sources that were consulted. Paul Reed's informative and accessible book will be essential reading and reference for anyone who wants to find out about the Great War and is keen to understand the part an ancestor played in it. This is an unusual approach to family history. The author has produced biographies of twelve individuals who served during the First World War, each of which is supported by an explanation of where the information was found. The resulting book is much more readable than most guides to family history. The twelve people chosen are very varied, and include a rare example of a major war poet of low rank, Britain's only black front line pilot of the war, men who served on the Western Front, at Gallipoli and in the Middle East, as well as a mix of survivors and the dead. This book is best used alongside a more traditional guide to the archives, using this book as inspiration and the guide to find out how to access the records used here or other related materials. The approach used here also means that the book is of value to readers with an interest in the First World War, but who don't intend to trace their own ancestors - the twelve mini-biographies are interesting in their own right. The author offers twelve brief biographies of those who participated and died during the Great War- ranging from an infantryman to a tunneller and from a black West Indian aviator to a naval rating. Each is concluded with details of the research which he undertook to illuminate their lives and their combat service. The Western Front Association, Stand To! Paul Reed is a military historian who has been treading the battlefields of France for over thirty years gathering many fascinating tales along the way. His book starts with a very basic but concise beginners' guide to tracing your First World War military ancestors, outlining the main classes of records and the repositories where they are held. The bulk of the text, however, is structured around twelve individual case studies, most providing a different take on a well-known subject of the war. When dealing with the Western Front, for example, the author not only ventures to Passchendaele but also takes us underground to hear from the miners. At Gallipoli we learn of the role of the ROyal Naval Volunteer Reserve, as experienced by sailor Fred Stoneham who suddenly found himself taking on soldiers' duties following the war's outbreak, and there's also the tale of the RFC pilot, William Robinson Clarke, one of many black British servicemen whose contributions to the British cause have been sadly neglected by history. With each story the author appends a section on how their stories were researched, providing inspiration for those with ancestors who may have shared similar experiences. Thoroughly recommended. He recounts their fascinating stories in separate chapters, and also illustrates the variety of records and research sources available when tracing First World War ancestors. This is the latest addition to the How Your Ancestors Lived series and deals with twelve English servicemen who fought and died in the Great War; it covers all services and includes a rifleman, an infantry officer, an aviator, a tunneler, a sailor and a Royal Marine, among others. The accounts themselves are often quite fascinating and often sadly tragic – although all are casualties, a few did survive the war. Each account is detailed. Reed describes their lives at the front, in rear areas and on leave. He looks at how they fit into the armed forces as a whole and the conditions they endured. Some of the more unforgettable chapters include: Britain's Black Pilot, A Poet at War, A Tunneler in France (for which a Victoria Cross was awarded) and, A Great War Guinea Pig, (which has to do with facial reconstruction from gunshot wounds). In each of the twelve chapters, the author describes how the research was done, what records were consulted and what methods were used in recreating their lives which makes this not only an excellent insight into the First World War but an extremely useful reference source for genealogists and historians. Great War Lives tells the stories of 12 servicemen who fought and died in the Great War – a rifleman, an infantry officer, a tunneller, a gunner, a Royal Marine, a naval rating and others. The author describes their wartime careers, their experiences in the front line and the conditions they endured. He also demonstrates how he researched and pieced together each man's life, and the sources he consulted. Beginning with a guide to Great War research, this book is both a moving and informative read for the family historian. Paul Reed will be well known to many visitors to this website from his excellent tour guides "Walking the Somme" and "Walking Arras" and from his regular TV work on both First and Second World War subjects. In "Great War Lives" he brings together twelve stories of individuals who served in the British forces in 1914-1918 and the methods by which he researched them. "Great War Lives" does not offer a step-by-step or in-depth guide to researching a serviceman but the advice is excellent, up to date and will inspire many people to have a try. It is refreshing to see that the author - who has long had an important presence on websites and discussion forums - is not afraid to promote the use of the internet as a research medium, although he wisely recommends that the information found should usually be treated with some caution. It is also gratifying to see "The Long, Long Trail" quoted as one of the recommended sites. The twelve personal stories are well chosen and cover much ground: there are soldiers, marines and airmen; officers and rankers; the dead and the survivors. As such their stories require a researcher to draw upon a wide variety of sources of information, and Paul Reed explains at the end of each chapter what sources were needed and where they can be found. He also demonstrates that there is more to unearth even for men whose stories have been told before, such as the tunneller William Hackett VC and the poet Ivor Gurney. I always enjoy reading tales of men who served and thoroughly enjoyed the book. For anyone might be encouraged to examine a soldier's military career, "Great War Lives" provides valuable advice, but it is more than that and offers an absorbing insight into men's lives, troubles, triumphs and, in some cases, their deaths in action. 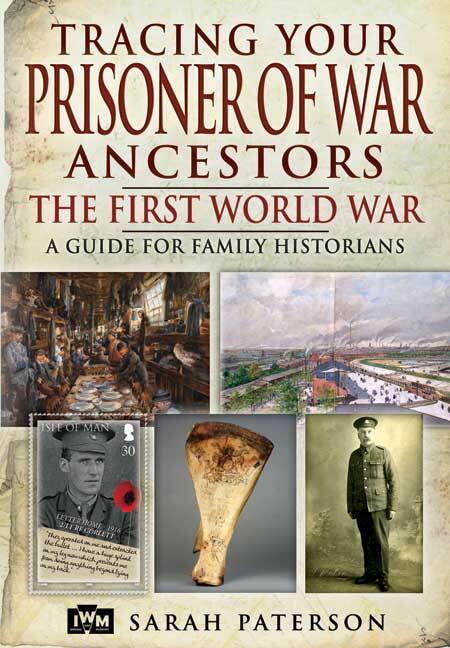 As more and more people start to look back at their family history and discover the Great War, this book will come as a welcome addition to their bookshelves (though it will be of interest to other readers too). Here, the author has told the stories of twelve servicemen, among them a rifleman, infantry officer, tunneller, gunner, Royal Marine, naval rating and airman. At the end of each story he describes the research he undertook and reference sources used for each one, which is aimed at assisting the reader to set out on their own course of discovery. Packed in to this book's 215 pages are 12 stories concerning sailors, soldiers and airmen of the Great War. And what fascinating tales they are too. To get us started, Chapter one takes us through the short life of Vernon James Austin, son of car manufacturer who would be killed by a sniper on the Western Front within two months of his twenty-first birthday. Author Paul Reed titles this chapter 'The Boy Who Came Home', Vernon Austin being one of the handful whose bodies were repatriated and laid to rest close to their families. Other chapter headings that equally draw the reader's eye to a particular story include 'A Greek Printer in the Trenches', 'Beneath the Western Front', which reveals the horrors of tunnelling, the tale of William Robinson Clarke in 'Britain's First Black Pilot', 'From Officer to Private' and 'A Poet at War', which recalls the traumas of the trenches as well as the tragic post-war life experienced by Gloucester poet and musician Ivor Gurney. But this is not just another collection of soldiers' tales. Full of passion and awareness of what went on, dedicated historian and Western Front dweller Paul Reed ends each of his stories with a detailed account of how he went about his research. This is invaluable information that will assist others, be they family historian or one of the many that dedicate years to the research of their local war memorials. Thorough, easy to understand and readable accounts of service life. The campaign in Gallipoli and Palestine, as well as the Western Front. Reliable information on Great War research. FOLLOWING 12 men, who fought and died in the Great War, their stories add personal detail to war history. At the end of each chapter there is an explanation of how the research for that story was conducted, giving a guide for those interested in military genealogy. Many books have been written in the past few years about how to trace First World War ancestors, mainly focusing on the survivng records and how to find and interpret them. This is excellent new book, from a highly experienced researcher, takes things further, presenting the stories of a dozen individuals who fought on the Western Front; at Gallipoli, Salonkia, in Palestine and in the air. Starting with a short chapter exploring the types of records that are available, including Medal Cards and Rolls, War Diaries, service records, casualty rolls and the press, Reed then looks at each individual in depth, telling their stories as derived from these records and surviving personal material. Lieutenant Vernon Austin, for instance, had joined the Special Reserve of Officers before the war and was called in August 1914 to serve with the artillery. He was killed by a sniper in 1915 - unusually, his body was brought home and buried by his parents. Fred Stoneham joined the Royal Naval Division, sailors who fought on land, and was killed at Gallipoli. Frank Plumb suffered horrific facial injuries but survived new medical treatments to live a long life, while William Clarke was a Black Jamaican who became a pilot in the Royal Flying Corps. Their stories, and others, are well told and should inspire family historians to explore, and equally importantly, write up, their Great War ancestors. In each case, Reed explains he methods and records that he's used including websites, local papers, letters and the Soldiers Died CD Rom (which he uses particularly imaginatively). This background offers great encouragement to follow in Reed's footsteps. But even without the family history material, the characters and stories in Great War Lives mean that it is a fascinating read in its own right. Fuelled by TV shows such as Who Do You Think You Are?, interest in family history has exploded in recent years. And because it was the first British war in which the whole nation - women worekers, nurses, and ambulance drivers, as well as men; volunteers as well as conscripts and professional soldiers, sailors, and airmen - were all caught up in the struggle, there is hardly a family in the land, or in the wider world of the former British Empire, without an ancestory who took part in the Great War. Thankfull, as the careers of those who took part in the conflict were documented with military effciency, interest in the war runs in tandem with interest in ancestry. 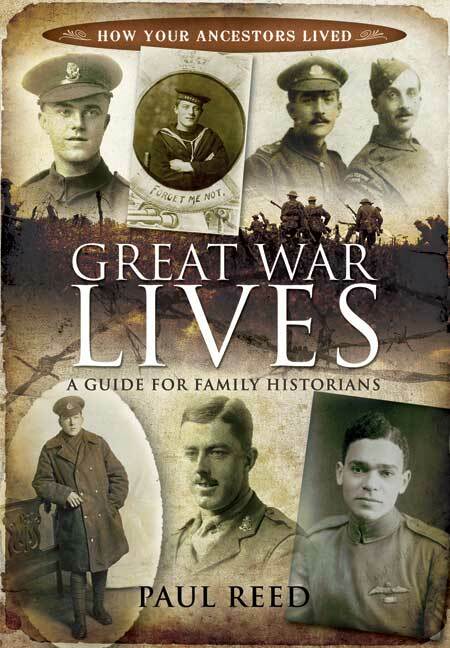 Combining his two careers as Great War historian and assiduous family history researcher, author Paul Reed here puts his unmatched knowledge and experience to excellent effect by documenting a dozen 'Great War lives'. He has carefully chosen his subjects to represent a cross section of the different fighting services. Thus, as well as a rifleman and an infantry officers, we have a tunneler (William Hackett, who tragically won a posthumous VC for his heroism in sacrificing his life deep beneath the trenches at Givenchy); a gunner (Vernon Austin, son of the maker of the eponymous popular car); and two Royal Marines (Fred Stoneham who fought and died at Gallipoli, and Henry Penn who did not survive the hell of Passchedaele). Perhaps most fascinating of all is Robbie Clarke, Britain's first black aviator, who overcame racial prejudice to come from his native Jamaica to fly and fight for the 'mother country' over the Western Front. Robbie, unlike Hackett, Austin, Stoneham and Penn, survived the war and lived into his 80's, the pioneering precursor of hundreds of black airmen who flew for Britain in the Second World War. Reed's book works on two levels. It provides a fascinating picture of the Great War experience of 'ordinary men' whose exploits were often far from ordinary; and it gives practical and concise guidance to readers researching their own Great War ancestors. However inexperienced you may be, Reed shows you how to get started from the most scanty initial information - an old medal or postcard forgotten in a drawer, for example - and what you might expect to find, as well as where to track down the data (both in museums and archives, and at a time when a wealth of such data is available online, in cyberspace). I can think of few books which are at the same time as moving and as useful as this one. Highly recommended. There’s been a notable growth of interest in First World War Genealogy in recent years. I think there are probably two reasons for this – programmes such as Who Do You Think You Are, and the prominence that they give to military history; and also the recent passing of the last veterans of the Western Front. Therefore this book by Paul Reed is most timely. Many military genealogy books seem to follow a structured but disjointed route – this is how you do this, this is where you go to do this, etc etc. and by the way, you can find this out from here because etc etc. But here Paul Reed has followed a different model, by purely writing about 12 individuals, and THEN explaining HOW he found out about them. I think this approach works, as the reader can become fully immersed in the story without being interrupted with details of musems, archives and suchlike. I think its a much easier approach for the layman in particular. Reed has chosen a broad but well-balanced range of individuals to write about. We find out about a Field Artillery subaltern who was killed in action but whose body was brought home to England; the village of Wadhurst (a timely counter to the perception that all Pals units came from ‘oop north’); The Royal Naval Division at Gallipoli; A Greek man on the Western Front; A Tunneller VC winner; A man who died in a base hospital; A Vicar’s son who fought in three theatres; A Royal Marine at Passchendaele; A ‘Great War Guinea Pig‘; An Officer who was dismssed from the Army for striking a French woman, but then re-enlisted as a Private; A Black Flying Corps Pilot and a little-known War Poet. Plenty to get stuck into, and plenty to inspire too. I’ve found it useful and inspiring for my own Portsmouth WW1 Dead research. Paul Reed is a leading military historian, specializing in the two world wars. He has been visiting European battlefields for more than thirty years, and lived on the Somme for over a decade. He has worked as a researcher and battlefield guide, and is the author of several books on the Great War. He also regularly contributes to television programmes, such as Timewatch, Meet the Ancestors and Who Do You Think You Are? and was historical consultant to BBC1’s My Family At War.